Retiring after 35 fulfilling years of high-school teaching, I am still mesmerized by the exquisite interplay of the ever-changing lake, the forests, and the living dunes. 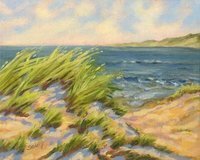 I am attempting through art to respond to the enchanting rhythms of waves, winds, sand, and light. I have worked in pen and ink, block print, pastels, and watercolor. Five years ago, I began working in oil and find the medium dynamically expressive of the intriguing layers of color that movement demands. Though self-taught, I have found painting to be a wonderfully intimate way to 'get in on the action' of the stunning beauty that surrounds us here.